For more information, see the contact page here. Welcome President Laura Bapp and Vice President Lester Welch! Thanks for stepping up! Join us at Ken and Wendy Ayers in Fort Plains, NY for a fun and educational day with Lippitt Morgans demonstrating their versatility! Remember, the gallery is there to showcase your new foals! 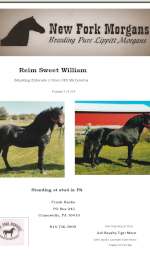 Remember: When selling your horse, if you don't know the buyer, get references! Contact their vet and farrier, and contact other Lippitt Owners whom you both might know. Come back soon! News, Updates and Events will be added often! Want to learn about other ways to advertise with the LMBA and contribute to our association? Click Here!